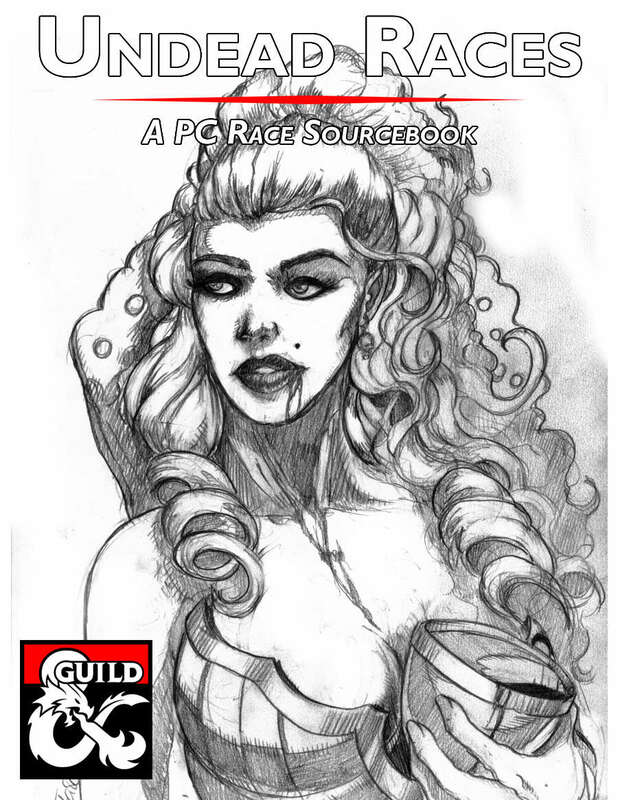 A short sourcebook featuring four playable undead races, designed for freshly killed PCs. A review copy of “Undead Races” was provided for the purposes of this review. In most D&D campaigns the undead serve as antagonists, either through the usual fodder of skeletons and zombies to cut through, or as big bad liches, vampires, and death knights. Undead player characters aren’t unheard of, but they’re a tricky thing to balance, especially when it comes to healing. “Undead Races” provides four playable undead races: Bound Spirits, Vampires. Specters, and Soulless. They’re designed for existing player characters to transition into should they die, as an alternative means to resurrection. “Undead Races” is a short, 10-page booklet that devotes about 1 page for lore, and 1 page for stat block to each race. Since most undead don’t really have their own culture, the lore sections explain how a PC could be transformed into their new undead incarnation, and how those creatures typically live out their questionable existence. Some of the undead work better than others. The Bound Spirit is a nifty idea as your soul (or conscienceless) is put into a construct body, typically a suit of armor. You’re not quite as cool as a Helmed Horror but you do get resistance to piercing and slashing damage, as well as immunity to critical hits (!). That’s kind of bland but also incredibly powerful. Healing also becomes tricky (a common theme for most undead) as you cannot be healed through resting or magic. Instead you have to be repaired, which equates to spending HD during a rest. It’s unclear if you still regain Hit Dice during a Long Rest, and if you can regain the same Hit Dice you just spent since you’ll be using them to heal. Of the four, vampire is the easiest one to apply, both thematically and mechanically. For balance purposes PC vampires don’t have to fear the sun, though I find it weird that they aren’t at least saddled with the Drow Sunlight Sensitivity penalty. Vampire healing is obviously tied to feeding on blood. There are two notes about healing that seemingly contradict each other: “All damage is healed if you consume enough blood” and two sentences later, “When you consume blood, spent Hit Dice as you would during a rest.” Like the Bound Spirit, there are no extra notes about when you can regain Hit Dice (vamps don’t rest! ), making another race where I’m not a bit confused on the healing mechanics. The Specter is the most bananas of the bunch. A ghost PC? As an action you can plane shift between the astral and material planes, and you’re completely incorporeal on the material plane. On top of that, as a bonus action you can become invisible! That sounds game-breakingly crazy. The specters have a similar curse to vampires, only instead of bloodlust it’s a strong emotion, like rage or jealousy. This is completely tied to the player’s ability to effectively roleplay their new emotionally-crippled ghost. Soulless is the most original of the races presented here. Soulless are basically the same as they were before, just, you know, without a soul. Thematically it makes them into bland sociopaths who begin to lose all emotion and purpose, which seems a tad delicate to role-play with others. Mechanically they gain the Deception and Performance skills, and immunity to mind control. By far the the least exciting but also the easiest to transition into. Undead races are a difficult thing to manage. I appreciate the notes on the hows and whys a PC may transition into each of these forms. A lot of thought when into making their abilities and powers reflect their new forms, but the balance level is a bit questionable, and there could be a few more details about healing with the bound spirit and vampires. All four undead: Bound Spirit, Vampire, Specter, and Soulless are very different from each other, with their own thematic traits and abilities. Each ‘race’ comes with a lore box on how and why a PC may transition into their new undead form. Healing for Bound Spirits and Vampires is vaguely worded and confusing. Specters are literally ghosts capable of plane-shifting and invisibility at will. What! The Verdict: Undead Races features four VARIED playable Undead for when You can’t let a Good PC Die.